USANA products do not currently contain krill oil. For now, based on purity, potency, concentration, availability, and cost, using fish oil as the omega-3 source in BiOmega is a great choice. Q. Is krill oil significantly more bioavailable than fish oil? A. Proponents maintain that krill phospholipids are “significantly more bioavailable” than fish oil. The actual data says something else. There are differences in the absorption rates and total amounts of fat absorbed from different forms of fats, but those differences are minor. Even in the best head-to-head experiments comparing fish oil to krill oil, there have been no statistically significant differences. The main difference in absorption may be due to high levels of free fatty acids in the krill oil, not to the phospholipid content. A study that looked at krill oil versus fish oil asserted that krill “could be more effective than fish oil” when comparing omega-3 levels in the blood. However, this is likely because the fish oil used in the study was not equivalent to the fish oil used in most supplements. The fish oil was diluted with corn oil, increasing the levels of omega-6 fatty acids in the oil, which would impact the way omega-3s are absorbed. The results likely would have been different if a properly balanced fish oil were used, such as BiOmega, which contains no omega-6s. Ulven SM, Kirkhus B, Lamglait A, Basu S, Elind E, Haider T, Berge K, Vik H, Pedersen JI. Metabolic effects of krill oil are essentially similar to those of fish oil but at lower dose of EPA and DHA, in healthy volunteers. Lipids. 2011 Jan;46(1):37-46. Q. Is krill oil better for supporting health? A. As a source of omega-3 fatty acids, krill can theoretically be beneficial for our health; however, there is not overwhelming proof that it is any better than fish oil. Quite the opposite. There is substantial evidence that fish oil is good for our health, while evidence for krill oil is scant. PubMed, the US National Library of Medicine run by the National Institutes of Health, currently (as of 6 June 2016) lists 4,468 studies related to human health and fish oil, while only 29 studies are related to human health and krill oil. Q. Have USANA scientists looked into developing a krill oil supplement? that claimed krill provided significant cholesterol benefits looked very good, but there were questionable aspects of the research. 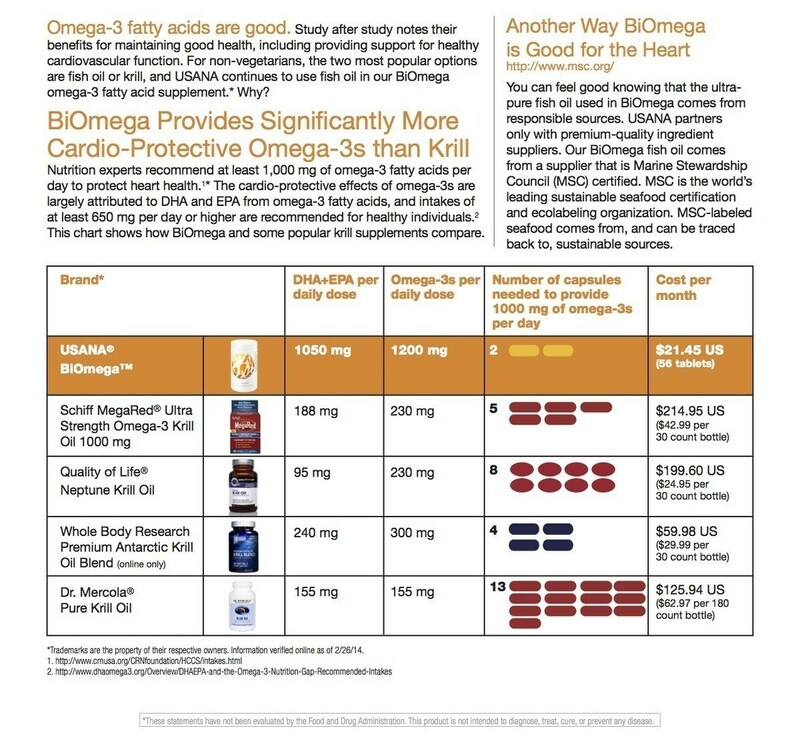 So, USANA scientists decided to run the same study (on a smaller scale) in our own in-house lab, using a commonly available krill oil supplement. Unfortunately, we were unable to duplicate the positive results of the krill study. Until USANA can prove the beneficial health effects and the published research is fair and compellingly strong on krill, we stand behind the quality and effectiveness of fish oil, which has ample proof for supporting good health. Q. What about the astaxanthin in krill oil? A. Astaxanthin is beneficial. It’s a red-tinted carotenoid that helps neutralize free radicals, so an omega-3 supplement with astaxanthin will provide a little extra antioxidant protection. Astaxanthin provides similar antioxidant protection as other more well known carotenoids like lycopene, beta carotene, and zeaxanthin.